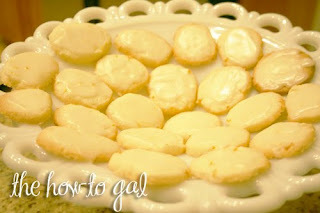 I have to share with you how-to make THE most delicious lemon cookies I have ever eaten...EVER. The recipe is from Taste of Home and I have linked to their website as well as posted it below. My comments are in bold. In a small bowl, cream butter and confectioners' sugar until light and fluffy. Beat in lemon peel. Combine flour and cornstarch; (I got to this part and realized I didn't have any cornstarch! If this happens to you, don't worry. You can substitute flour instead, you'll just need to double it. So since here it calls for 1/2 cup cornstarch, just add a cup of flour. This should work for any recipe and it should taste the same.) gradually add to creamed mixture and mix well. Cover and refrigerate for 1 hour or until easy to handle. Unwrap and cut into 1/4-in. slices (You can see from the picture, I cut them a little thin my first time, but the thickness really is up to you! My second time making them, I cut them much thicker and enjoyed them more). Place 1 in. apart on ungreased baking sheets. Bake at 375° for 9-11 minutes or until set and edges are lightly browned. Cool for 1 minute before removing to wire racks to cool completely. 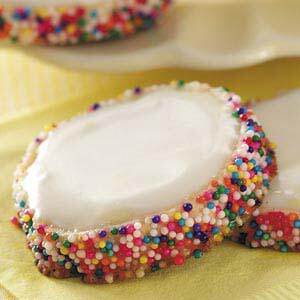 In a small bowl, combine icing ingredients. Spread over cookies. Yield: 28 cookies. Hello! I found you on Lady Bloggers! Your blog seriously rocks! You have so many awesome ideas. LOVE the baby crinkle toy, and we certainly have plenty Kirkland baby wipes around here. The Lemon Gems look simply amazing. Can't wait to browse your blog some more. You should make these cookies for Joe's and mine graduation party. Yum!